CAPE ELIZABETH, Maine (February 13, 2018) – The TD Beach to Beacon 10K Road Race has chosen as the 2018 race beneficiary WinterKids, a Maine nonprofit that teaches Maine children to move, learn and explore in the outdoors during winter, race organizers announced today. Since its founding in 1997, WinterKids has helped more than 100,000 Maine children to get outside and active with innovative outdoor education programs for preschools and elementary schools statewide. This year marks the organization’s 20th anniversary of WinterKids founding program, the WinterKids Passport, which has afforded thousands of Maine children the opportunity to learn to downhill and cross-country ski, ice skate, snow tube, and snowshoe at 50 participating winter sports partners across Maine. In 2016, the organization began serving children in New Hampshire schools as well. WinterKids helps children develop healthy lifelong habits through education and fun, outdoor winter activity. The organization delivers innovative outdoor programs for families, schools and communities. For more information, visit www.winterkids.org, or find WinterKids on Facebook, Twitter and YouTube. The TD Charitable Foundation, the charitable giving arm of TD Bank (www.TDBank.com), will provide a $30,000 donation to WinterKids. The TD Charitable Foundation has now donated more than $600,000 to Maine charities over the history of the TD Beach to Beacon. WinterKids will further benefit from fundraising activities, including the race’s charity bib program, as well as increased awareness through its association with one of Maine’s premiere sporting events. Previous beneficiaries so far have raised an additional $1.6 million or more in total beyond the TD Charitable Foundation donation. WinterKids Challenge – helps teachers get their young students outside and active more often during the school day with training and enrichment materials, technical support and resources, supplies and incentives. In 2016, this program won the Maine Public Health Association’s Public Health Program of Excellence Award. 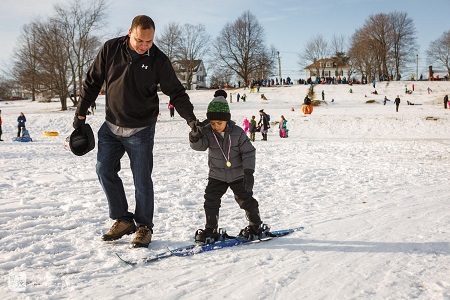 Welcome to Winter Festival – this annual event at Payson Park in Portland (held this year on Jan. 20) draws more than 1,000 Mainers to experience the thrill of sledding, snowshoeing, ice skating and more. 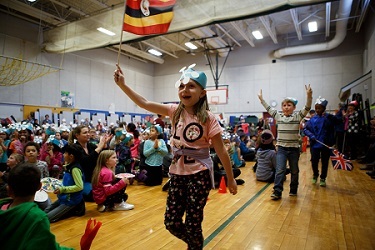 WinterKids Winter Games – held last month (Jan. 1-31) ahead of the 2018 Winter OIympics, one elementary school in each of Maine’s 16 counties – involving 230 teachers and 4,215 students in all – competed in a four-week outdoor physical activity and nutrition challenge for cash prizes, equipment and more. WinterKids Passport – offers 5th, 6th, and 7th graders across Maine an opportunity to choose a winter activity, from downhill and cross country skiing to ice skating and snow tubing, by providing free and discounted tickets, lessons, and rentals at 53 recreation areas. 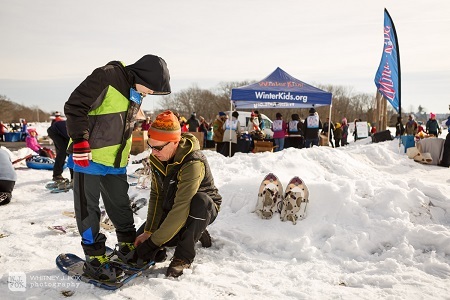 WinterKids FunPass – gives children from preschool through 4th grade the chance to try cross country skiing and snowshoeing on groomed trails, for free, at 20 recreation areas. WinterKids Downhill 24 – a 24-hour team ski and snowboard challenge at Sugarloaf to raise awareness and funds for WinterKids programs. This year’s event is set for March 2-3. WinterKids full calendar of 40+ programs and events can be found at www.winterkids.org. 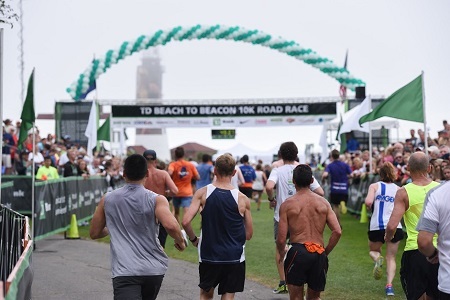 The TD Beach to Beacon, set for Aug. 4, draws runners from throughout the region and the world to picturesque Cape Elizabeth. The race begins near the Crescent Beach entrance on Route 77, winds along tree-lined streets and past breathtaking ocean vistas and ends in Fort Williams Park at the historic Portland Head Light, the most photographed lighthouse in the world. Last year for the special 20th running of the race, a record-setting 6,887 runners from 18 countries, 43 states and more than 270 Maine cities and towns finished the winding, rolling 6.2-mile coastal course. Thousands of spectators cheered runners along the route and at the finish, and more than 800 volunteers helped ensure a smooth operation. The race debuted in 1998 with 2,408 runners crossing the finish line. More than $90,000 in prize money is awarded to the top finishers and place winners in the various categories for men and women. The TD Beach to Beacon 10K is directed by Dave McGillivray of DMSE Sports (www.dmsesports.com), who also directs the B.A.A Boston Marathon and is regarded as one of the best in the business. WinterKids is an independent 501(c)(3) nonprofit organization with a mission to help children develop healthy lifelong habits through education and fun, outdoor winter activity. The organization delivers innovative outdoor programs for families, schools, and communities. WinterKids’ Major Community Sponsor is Hannaford and its Supporting Sponsors are L.L.Bean, Irving Oil, and WMTW Channel 8. For more information, visit www.winterkids.org.